The largest stone ever moved by man, as far as I know, is the stone moved to St. Petersberg to serve as the base for the equistrian statue of Peter the Great. It was called the Thunder Stone, and was moved four miles by land from a swamp in Finland, to a waiting barge. It weighed 1250 tons, by far the heaviest stone known to have been moved by man. It traveled by barge to its resting place in St. Petersburg, and was carved to it's final shape as it was being moved. It started out as 1500 tons, and was something like 1250 tons when in its finished form. In 1835 Sir Henry Rawlinson investigated some writings and figures carved in a stone wall on the road between the ancient capital of Babylonia and Media, located in modern Iraq . The writings were on a panel carved into the rock, the panel being 15 meters high and 25 meters long. The panel is 100 meters above the foot of the cliff. Using copies of the text that he made, Rawlinson determined that the text of the inscription was a declaration, geneology, and history lesson written by King Darius of Persia, written before his death in 486 BC. The inscription was important because the same message is written three major languages of the day: Old Persian,Elamite, and Babylonian. Like the Rosetta stone, the fact that when one of these message could be deciphered, that meant the other two messages could be deciphered. About one third of the Old Persian alphabet were known, and Rawlinson figured out the rest, aided by the fact that the ancient language had similarities to the modern Persian of the region. Once the words in Old Persian were known, translating the same words in the other two languages came fairly fast. Thus was learned how to read these old languages. When the text was finished, Darius had the access trails to the rock panel cut away, which helped preserve the inscription to modern times. Theories on how the Great Pyramid at Giza take various forms. Most of them have involved some form of ramp, up which the large stone blocks were hauled. The problem was that construction of some of the ramps would have taken more effort and material than the pyramid itself. Recently a French architect has proposed a theory that seems pretty logical, and solved a lot of the problems with the previous ramp theories. Fleshing out a theory suggested by his architect father, Jean-Pierre Houdin spent most of a decade planning how he would build a pyramid, and developing 3D computer models to show how it could be done. His plan involves the use of a ramp, but one which is internal to the pyramid, which is made of straight sections which turn at the corners and create a straight sided spiral to the top of the pyramid. When the ramp reached a corner, there would be a platform and a crane, for turning the block of stone 90 degrees, so it could proceed up the next section of ramp. Of course, the ramp theory will not be proven until a pyramid is taken apart to verify that an internal ramp exists, which is not likely to happen anytime soon. Mr. Houdin was resigned to that uncertainty, and had been making presentations of his theory. After one of his presentation, he was approached by a member of a German team which in 1986 had undertaken a project of scanning the pyramid looking for internal passages and chambers, using a sensitive gravity sensing technology. The member of the German team said that beside their published report, they had some images which they could not explain, so they were not included in the report. The images are below, and show regions inside the pyramid which showed as low density zones. Maybe they are internal tunnels, ramps, or tunnels filled with rubble from the building process. They match almost exactly Houdin's calculated positions of the internal tunnels and ramps. Another bit of supporting evidence is seen on the pyramid itself, where a notch on one of the corners appears to be an exposed turning platform theorized by Mr. Houdin. When the notch was explored by Bob Brier, he found a small room behind the platform, inside the pyramid, on the notch. This room appeared to be from the time of the construction of the pyramid, because the entrance to the room was smaller than the stones that would have been removed to form the room later. The roof of the room also had stones which were shaped to a dome shape, to support the weight of the stone above the room. A project has been proposed to penetrate the wall of the hidden room to see if behind it is an internal ramp. This theory was presented by Mr. Houdin and Bob Brier in Secret of the Great Pyramid. See these links for more information. Its not often that one runs across a history book that you can't put down until you have finished. This new book about Alexander the Great is such a book. It is very readable, unlike many other books on ancient history, and explains the ancient battles and tactics in a much more understandable style than other books. Alexander might have been better called Alexander the Bold, or Alexander the Lucky, or Alexander the Inheritor of Philip's Army. It was Philip who developed a style of soldering that could allow an army of herdsmen to challenge the Greek phalanx staffed by soldiers wearing expensive bronze armor. Philip also developed the battlefield tactic of advancing his army to strike a point to one side of the enemies line of infantry. By striking with a wedge instead of a direct frontal attack, the enemy's line would inevitably be pulled out of formation, allowing the rest of Philips line to attack them when the unity of the Greek phalanx had been weakened. Philip also drilled his army of herdsmen until they fought as a unit, could turn and defend from mulitple threats, and were hardened to forced marches and extremes of weather and terrain. Philip developed the innovative sarissa spear and the tactics of using it, and the training in its use in battle. The sarissa was longer than the spear of the Greek phalanx, and made Macedonian lines a veritable porcupine of spears, and was specifically designed to defeat the Greek phalanx. Alexander was smart enough to use all that Philip had developed, and had the political genius to gather allies, eliminate threats, cojol reluctant troops, and added his own genius to the tremendous assets he had been given by his father. Each of his three major battles with the Persian army, which always included a fair number of Greek mercanaries, involved an asymmetical battle line, which showed Alexander's confidence in the Macedonian battle tactic, and his father's wedge attacking style. In each of the three battles against an overwhelmingly superior Persian army, the impenetrability of the sarissa armed Macedonians and the ability of the Macedonian cavalry to exploit weaknesses in the enemy's battle lines carried the day. These topics and all of Alexander's battles, politcal intrigues, and his far thinking plans for his empire are presented in a very enjoyable style. I'd highly recommend this book. Here is an interesting belt drive bike from 1890. 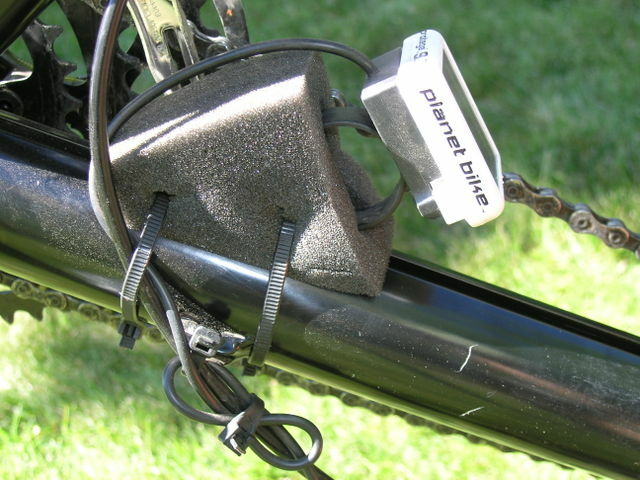 I have been looking for a way to light up the flagpole on my recumbent trike, and found a product that looked like it would work, the Arizona Whip. Jerry at arizonzawhips.com was very nice to work with, and I got it hooked up this past weekend. The whip is 5" tall, and is of clear lexan. Inside the clear tube are 24 LED lights, 12 facing forward and 12 facing backward. Each side has a red group, and a yellow group, and on one side the red and yellow groups of LEDs flash on alternately. Jerry has other color configurations, including a red, white and blue one. The whip screws into a clamp that grips the 1.25 inch tube of the rear wheel fork. The clamp is for 1.5 in. tubes, but with some rubber and duct tape shimming, it grips the 1.25 inch tubing nicely with one Allen bolt for tightening. 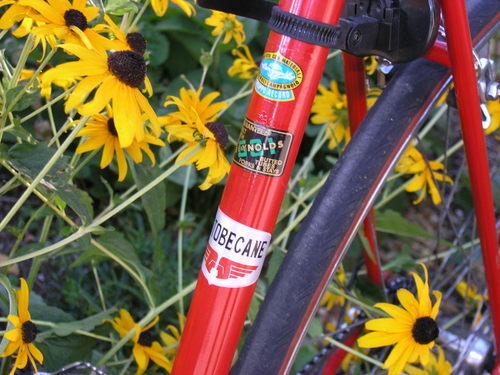 It extends up through the frame and clears the panniers, rack, seat, and headrest nicely. These pictures show the whip in daylight, and the clamp attached to the frame. I ran a switch forward to the left hand grip, so I can turn it on and off from the seat. It runs off a 9 v battery. I have not ridden it to work yet, so I don't know how long the 9 v battery will last. The picture below is how it looks at night, from the rear. The bike is facing not quite straight, and the bag on the rack is blocking one of the LED lights. The headlight is shining across the street at an angle, and provides lots of illumination. This sucker is not cheap at $150, but if I can get noticed by a car either ahead of or behind me, it will be worth it. I've been experimenting with a lighting setup that is as bright as a Dinotte, but way cheaper. It is based on a replacement LED bulb that an inventor I work with has just come out with. With this insert, a 60 lumen Surefire flashlight becomes a 240 lumen monster. The batteries also last longer, due to a heat sink that improves efficiency. This light is brighter than a car light, because I've driven at night in a car, shined the flashlight ahead onto the road, and you can see the spot in the pavement illuminated by the car headlights. It is unbelievably bright. I was camping next to a huge rock outcropping and I lit up the whole rock with this little tiny flashlight. When I drive down the street on my bike in the morning, all the reflective signs bounce light back at me. I took it into an REI store and compared it side by side to a Dinotte, and they were about equal. The parts are shown in the picture below, with where to get them listed below the picture. The picture below shows two Surefire flashlight setups. One has a converter, available on ebay for about $8, which allows it to take longer batteries which last longer. The regular batteries last about 1.5 hours, the larger ones about 2-2.5 hours. Flashlight Setup 1 : Surefire 6P flashlight (about $60) (or SureFire 6Z, C2, M2 and G2 or Cabela's 6 v flashlight ($32); from Surefire, Amazon, ebay or Cabela's. Malkoff M60 insert: about $50: (replaces the fragile bulb that comes with the flashlight), from Tactical Design Labs (http://www.tdlabs.com/ if link doesn't work, under the "New" menu tab.) They are selling the Malkoff device as an upgrade for police, who use Surefire flashlights extensively. They say "It will easily illuminate objects at 350+ feet and will blind opponents within a 100 foot radius." I believe a Malkoff flashlight will easily to that. Surefire converter, ebay for $8, allows use of the longer 17500 batteries. 2 Batteries, AW Brand-17500-Protected-Rechargeable-Lithium-Battery from Lighthound.com, $11 each. Fenix 360 Bike Mount, light holder, $15, this is high quality in fit and finish, but rattles. A small rubber band between the top half and bottom half stops the rattle. 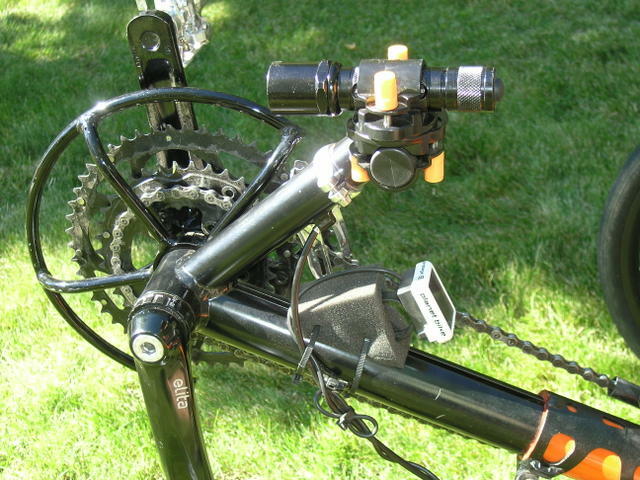 A no-name brand is also pretty decent, on ebay for $4 shipping, titled: New Bike/Bicycle LED Flash Light Mount Clamp Holder. These are a little loose on the Surefire, so I put a section of inner tube around the flashlight body, for a tighter fit. I hope someone tries this setup and tells me how it works for you. 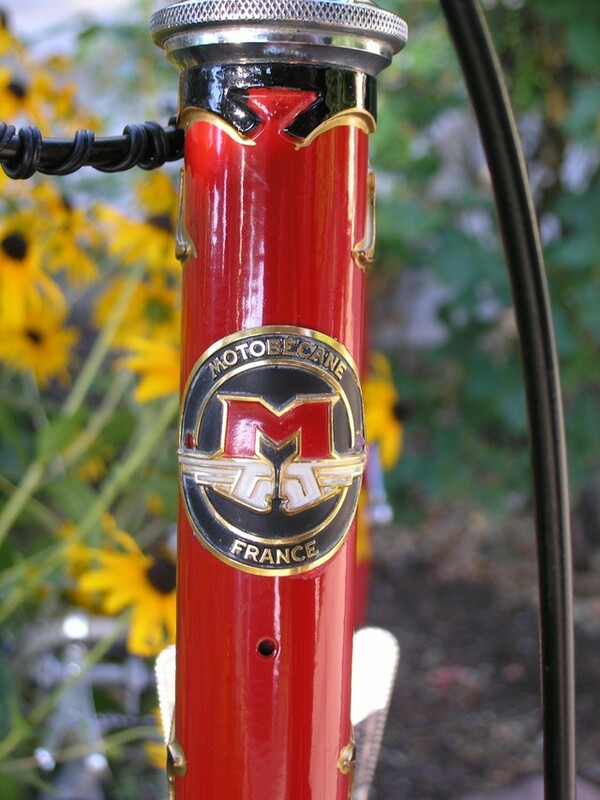 I am declaring the 1973 Motobecane restoration done! 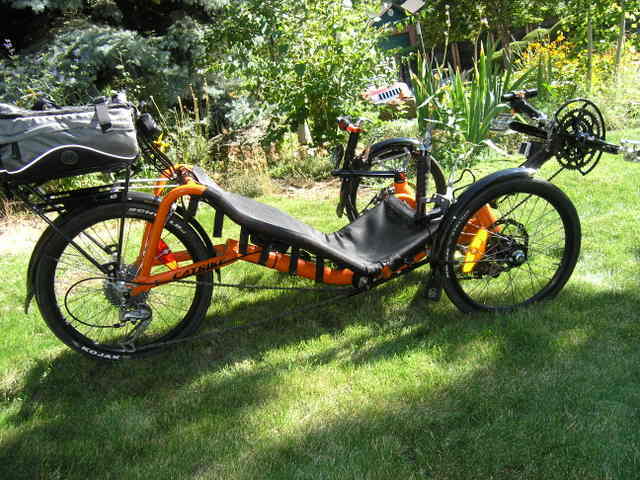 I have not been riding it lately because the Catrike Speed is so much fun. I got a Motobecane headbadge, decals, a Cinelli stem, and Campy seatpost. 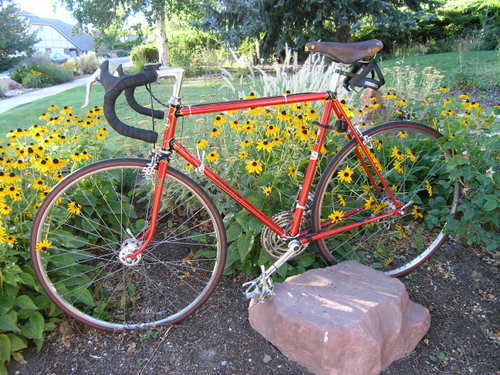 The saddle is the original Brooks Professional, and was always pretty comfortable. The aero brake hoods are an upgrade from the original centerpulls. I have been enjoying my newest ride, a Catrike recumbent trike, the Speed model, since the spring of '08. I have been riding it to work about everyday, and building up my trike muscles. 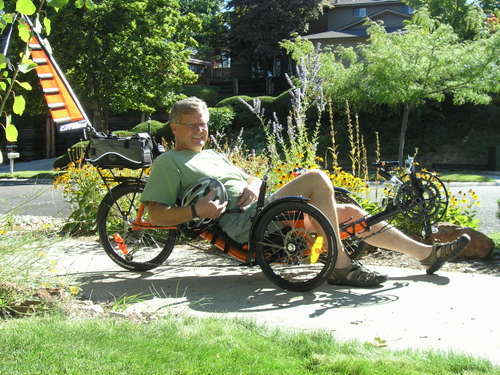 Pedaling a recumbent trike uses different muscles from riding a DF (diamond frame), and it takes several months to build them up. My ride from home starts with a fun little hill that gets the heart racing. I have hit 38 on this hill, then on flat sections of my route I have hit 26 mph for short bursts. This video was shot after I had the trike for a week, and shows the fun part of my ride to work. I have found that riding a trike is a lot of fun, but no way is it as fast as a road bike. However, it is fun and comfortable. There is back support, no need for padded crotch pants, nor padded gloves. You also can't fall over, and can crank up a steep hill as slow as you want. In the early 1970s the outdoor equipment industry was changing rapidly. Kelty backpacks were the premier backpack, with others made by Jansport and Alpenlite being quality brands. REI made a Cruiser which was a cheap imitation of the Kelty. The packs of that era were not called external frame backpacks, because there was no internal frame backpack to require the distinction. John Robinson and Jim Lawrence were working for Kelty designing new products, and the project headed by John Robinson was the Tour Pack, the world's first internal frame backpack, first sold in 1973. The Tour was blue, and appeared small and simple compared to today's internal frame packs, but you can definitely see it is the genesis of all those that followed. Alp Sport, Gerry and North Face had pack swith some sort of bendable aluminum stay, but they were primarily ruck-sacks with no viable hip-waist suspension system. 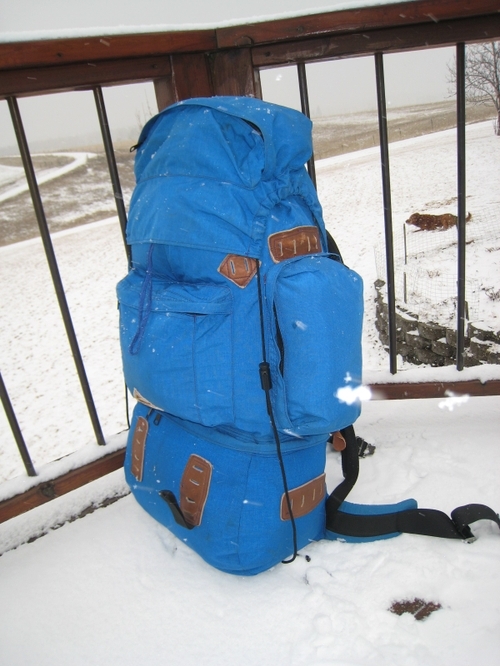 Shortly after the Tour Pack came out Choiunard made an Ultima Thule, and Gregory and or Rivendell soon followed with similar packs. Kelty sent models of the Tour Pack to myself and Ned Gillett, who both gave it high marks. John Robinson and his climbing buddy Steve McCarthy did a nine day winter transit from Mammoth Mountain to Yosemite Valley on skis using the Tour Pack. That was with winter bags, tent and lots of food, on x-country skis over interesting terrain. The packs worked perfectly. The side pockets of the Tour served as ski holders, and you could slip your skis behind the pockets. The bottom compartment was a zippered sleeping bag compartment. 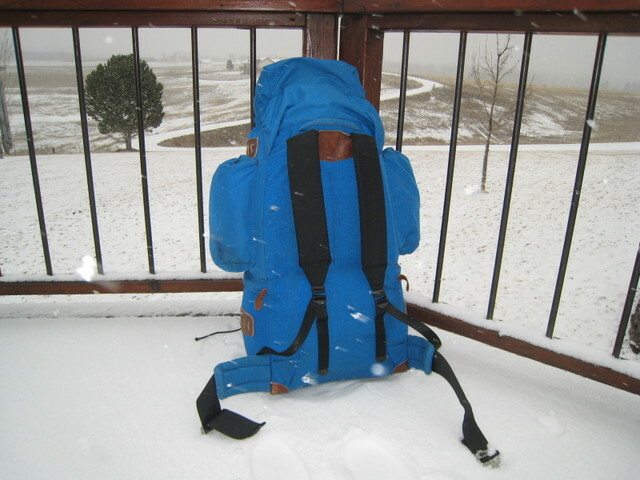 The pack had leather patches for securing skis, crampons, and ice axe. The top flap and rear panel had zippered pockets. 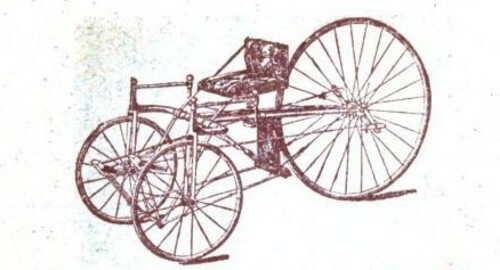 The first tricycle that I have found with the two wheels in front and the larger wheel in back (the tadpole configuration) was patented in England before 1876, and sold as by the Rudge company. The seat was like a carriage seat, with coil springs to absorb shocks. The large rear wheel was the drive wheel, and the front wheels were for steering. This model is propelled by levers and cranks, but this mode was later replaced by the chain and crank. Between 1880 and 1890, this form of bike was one of the most popular cycles in England, being even more popular than two wheelers. Below is a picture of a strange technology, that maybe some smart person can identify. 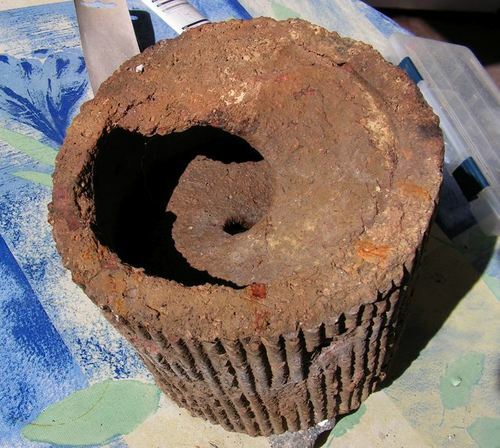 This is what appears to be a clay or ceramic Archimedes Screw. This is one of several pieces of the devices, which were bound together. They were found on a bluff overlooking the Savannah river, about 10 miles upstream. There was a settlement of people from Austria in the area who immigrated to the region in starting in about 1730. They made a settlement about 100 yards from the river. By the shape of it I am guessing it is an Archimedes screw, presumably made to lift water. How would something this heavy be supported for turning? I wonder if anyone has heard of ceramic screws of this type being made in Austria or anywhere else? 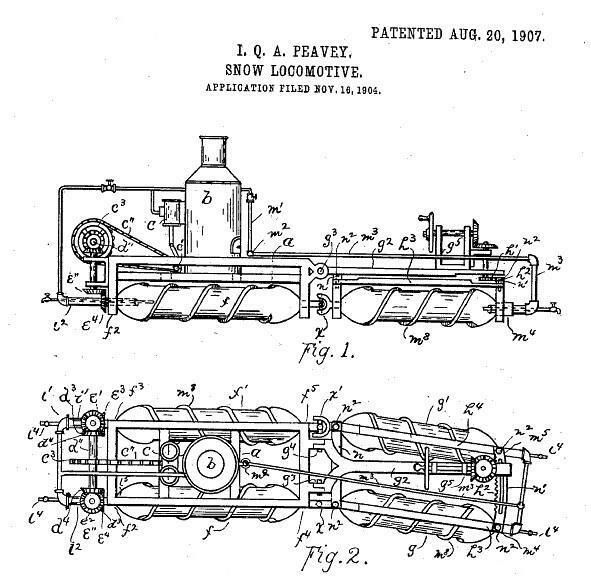 Thanks to Terry Harper, who informs that "one of the earliest such vehicles was patented by Ira Peavey of Maine in 1907. At least two were built and tested succesfully. One was stream poweredm the other used a gasoline engine. 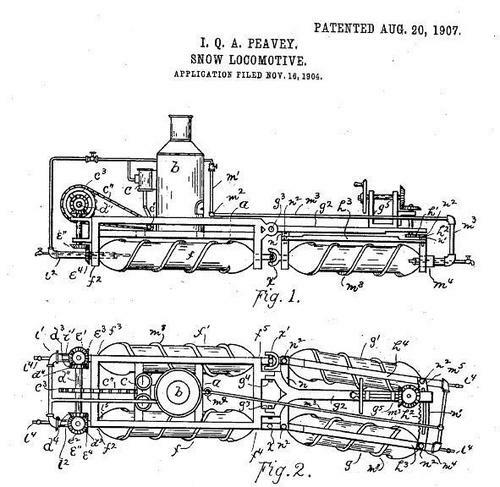 Peavey's machine was designed to haul trains of sleds loaded with logs. However, he had to compete with Alvin Lombards steam Log hauler which had appeared earlier in 1902. While Peavey's machine worked great on hard packed snow it was near useless in soft powder. In addition its relatively rigid construction meant that it tended to rear and plunge over the hills and humocks associated with a rough winter haul road and was quite hard on the drawbars of the sleds. In this respect the Lombard proved to be a much better machine and dominated the market here in the north east."